Possible one of the least original value idea’s of 2017 must have been New York REIT (NYSE:NYRT). I always feel uneasy when so many people like something, but I could understand the attraction here. The story previous year was simple. The stock was trading around $10/share, a new manager had taken over with the mandate to liquidate the REIT while NAV/share was above $12 and incentive payments were struck at $11/share. Unfortunately, realizing those numbers proved a bit harder than expected and (adjusted for $5.07 in liquidation distributions already paid) NAV/share is now standing at just $8.03/share. No wonder that people so far have been disappointed with how the story is playing out. But with only a few assets remaining, and not much uncertainty with regards to the value of the remaining assets, I think the stock is currently trading at an attractive discount. Management believes that the combined team of SL Green and RXR Realty will add the necessary talent, expertise and capital, along with the capital contributed by us, to bring this Class A asset with its blue chip tenant roster to its full potential. 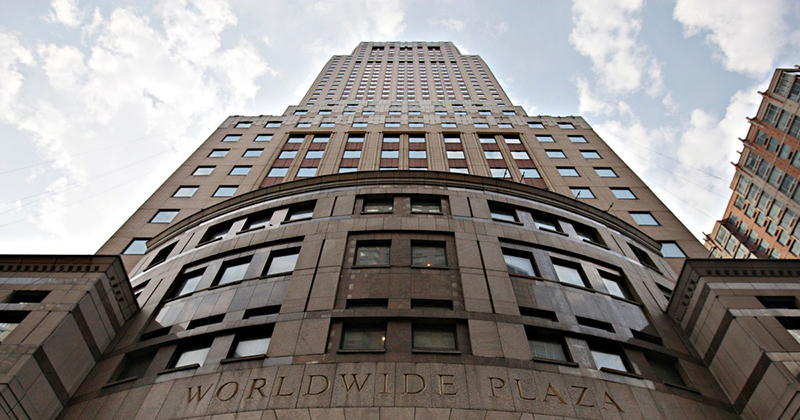 Management believes that implementation of the business plan for Worldwide Plaza will take at least two years and may take up to four years given the size of the building, which is a little over 2 million square feet, the scope and nature of the capital investment and to allow time for the critical milestones in leasing and asset repositioning to take place. Management believes that if these actions are successful, the estimated value of the property could increase to between $1.9 billion and $2.2 billion, on an undiscounted basis, by November 2021, our estimated sale date of this investment. 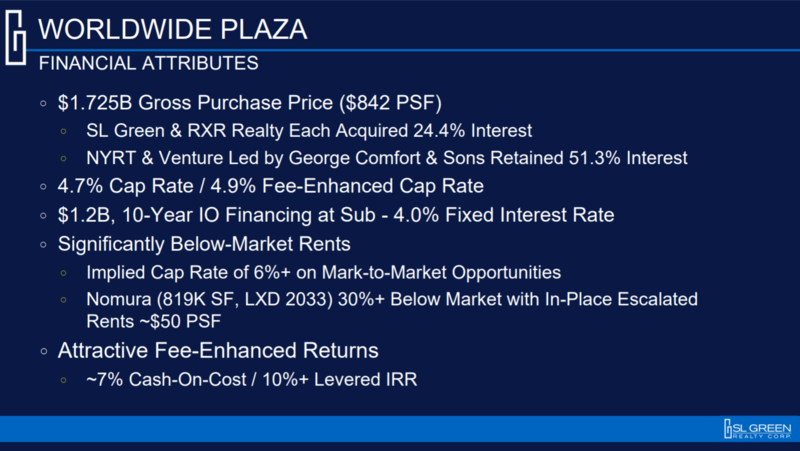 Assuming additional investment in Worldwide Plaza of $64.0 million, plus a corresponding investment from our joint venture partners, a future value for Worldwide Plaza between $2.0 billion and $2.2 billion would produce a residual value between $2.19 and $2.77 per share, an increase of $0.32 to $0.90 per share over our current carrying value. In addition, we have contractual rents which generate a predictable cash flow from Worldwide Plaza during the estimated four-year hold period which, net of expenses, we estimate would produce an additional $0.43 per share over the four year hold period versus the $0.13 currently accrued. I can wait a couple of years for a discount to close when getting paid 7%+ in the mean time. If we throw some of these numbers in an IRR calculation we get some pretty decent results. Note that the 1.725B valuation should perhaps have been labeled 1.85B since it’s based on the current valuation, but it assumes that the planned $128 million in capital improvements isn’t money flushed down the toilet. The 2.0B and 2.2B valuations are inclusive of the improvements. Of course, between now and 2021 a lot can happen. Given that the LTV-ratio on the WWP building is ~70% a relative small change in valuation can have a relative large impact on the eventual financial result. You can still have a decent single digit IRR if the WWP building declines by ~10% in value, but around ~15% you are already around break even and above that you are quickly going into negative territory. Assuming that the building in four years time will be worth just as much as today (plus the value of the capital improvements) is in my mind a reasonable conservative base case scenario. Getting paid a double digit rate on return sounds pretty good to me, and if they would be able to execute on their plan to increase the value of the property, that would just be the icing on the cake. It’s going to take 4 years before the rest of the story plays out, and not everybody might have the patience for that, but that might exactly be why there might be an opportunity. This entry was posted in Portfolio and tagged NYRT on March 8, 2018 by Alpha Vulture. Have you considered the tax consequences for a European investor? As far as I know, a non resident alien has to pay US income taxes on income in connection with US-REITs. In my understanding, there are no double tax agreements. I think for me personally the tax consequences are not very material. But given that most of it will be a return of capital I think it should be okay for most people. If it gets delisted, as with Winthrop, ECI withholding tax would apply to distributions to foreign investors. Given that NYRT will be delisted at the end of the year I view NYRT as equivalent to a private market investment in a single RE asset. I don’t think people would get excited about a 12% return in such an asset. Special Opportunities Fund SPE has a largish stake in NYRT … another possible way to get exposure. Forgive me if I am wrong but they own ~1.7m shares worth ~$4m after the dividend, i.e. they have a ~3% allocation in SPE. Even if you allocate 20% of your portfolio to SPE AND NYRT doubles you still gain only 0.6%.